Holly is the Practice Principal and Managing Director. 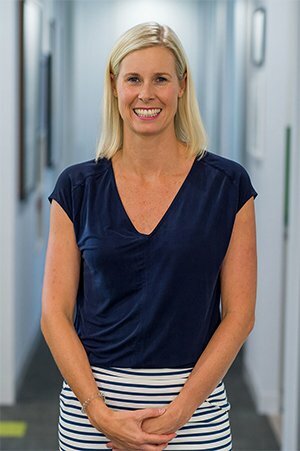 She graduated from Sydney University in 2000, has since completed a Masters in Sports Physiotherapy through La Trobe University and is a Titled Sports Physiotherapist. Holly is the National Chairperson for the Australian Sports Physiotherapy Association. Holly has a special interest in Clinical Pilates and heads up the Pilates team at the Bridgepoint Clinic. Holly has also completed her Women’s health training and is qualified to treat pelvic floor issues, incontinence, pelvic pain, constipation and bladder problems. She especially enjoys treating pre and post natal women, adolescents and hip and lumbopelvic disorders. Her use of Real Time Ultrasound enables her to use the imaging of deep musculature in the abdomen and around the hip to closely direct her patients rehabilitation. Holly spends some of her week looking after her two young children and when she has a spare minute Holly likes to run, swim, go to the gym and shop.